Assalamualaikum wa Rahmatullah wa Barakatuh. Alhamdulillah. Solatan wa salaman ‘ala Rasulillah. Amma ba’du. Sheikh also emphasised that, the main factor which contributes to the healthy learning environment is the instructor; the teacher, referring to his or her physical, emotional, intellectual and spiritual hāl. 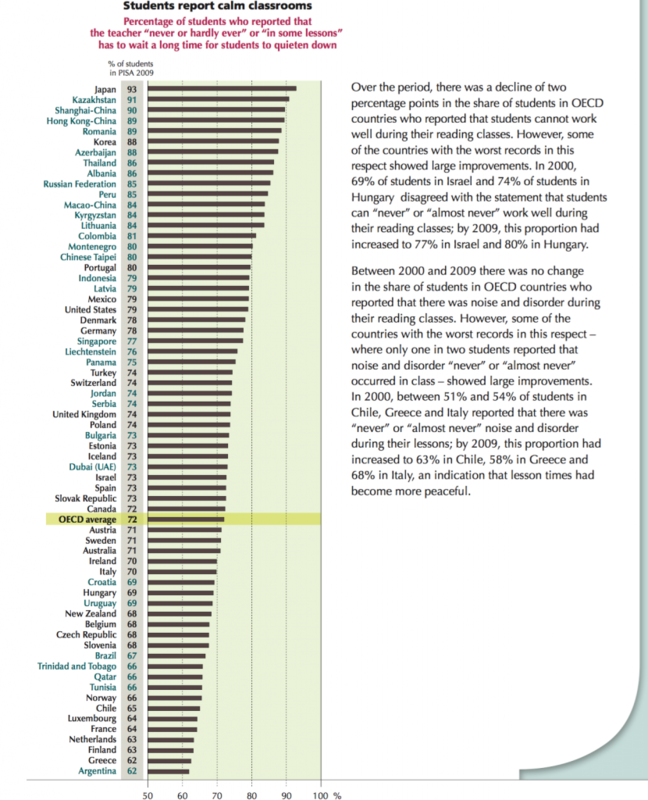 I would like to refer this issue to PISA 2009 report. Results from PISA 2009 show that disciplinary climate is strongly associated with student performance. students who reported that their reading lessons are often interrupted perform less well than students who reported that there are few or no interruptions in class. Based on the level of noise in the classroom, some top leading Asian countries like Japan, and Shanghai-China have the quietest classroom. While among the noisiest classrooms is country like Finland, which is also known having one of the best education system in the world. Professor Kirsi Tirri explained, Finnish classroom is noisy because of the democratic characteristic it has due to the student-centered classroom, when teachers and students are constantly engaged in discussions. This indicates that a good classroom is not necessarily the quietest one, but the key point is the engagement. That is why, it is important when Sheikh Ramzy included ‘functional’ as one of the main characters of a good learning environment. There is no point of having a quiet, calm, authoritative teacher to student kind of environment while students are not engaged and learning is hardly functioning. We need to balance between disciplining the students and keeping them enthusiastic. The students must be disciplined to uphold the right manner. But it doesn’t make them passive as passiveness is not the character of learners in the halaqah of the Prophet PBUH. One of my favourite hadith of the Prophet PBUH when discussing about instruction in a classroom is the story of Malik ibn al-Huwayrith r.a. which Sheikh Ramzy discussed in the video. Everytime I read this hadith, it reminds me with Dale Carnegie’s How to Win Friends and Influence People. How Rasulullah PBUH was so interested with his students, sincerely asked them what bothered them, acknowledged their conditions and even at that particular session, he stopped his lesson, let the students went home, and somehow, made the students bring home the lesson to practise. How efficient the pedagogy was… when the Prophet PBUH applied all the qualities that are now associated with 21st century education! He was indeed the best teacher, not simply because we are Muslims and he was the Messanger of Allah, but even from the ‘secular’ point of view, he was truly the greatest teacher of all time. It is getting more challenging nowadays to have a good learning environment for our classroom. I am referring to what Dr. Leonard Sax mentioned in his book The Collapse of Parenting: How We Hurt Our Kids When We Treat Them Like Grown-Ups. In many ways, children come from home when nurturing good culture is not effective, if not completely absent. Children are not so much aware with their surrounding and therefore cleanliness, keeping the physical surrounding good, clean and beautiful, pleasing to Allah, is no longer a common sense. Therefore, teachers carry heavier burden to run the shaping process for students to learn to respect themselves, others, and the world around them. Before the lesson begins, it is a routine for all teachers in our school to make sure that the floor and tables are clean, all unnecessary stationaries and books are removed from the table, students’ attires are in good condition, and then only teachers will begin the lesson. This is needed repeatedly. We do it with kind but firm. 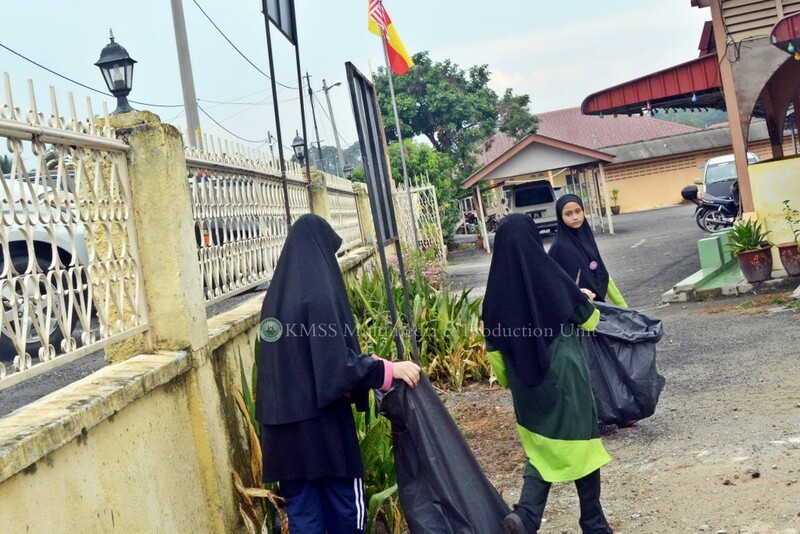 We reward our students with smile, praises, and sometimes some little surprises for upholding the third responsibility of being a good Khalifah and that it to keep the physical world good, clean and beautiful, pleasing to Allah. Listening and questioning are the important signs that students are well engaged. 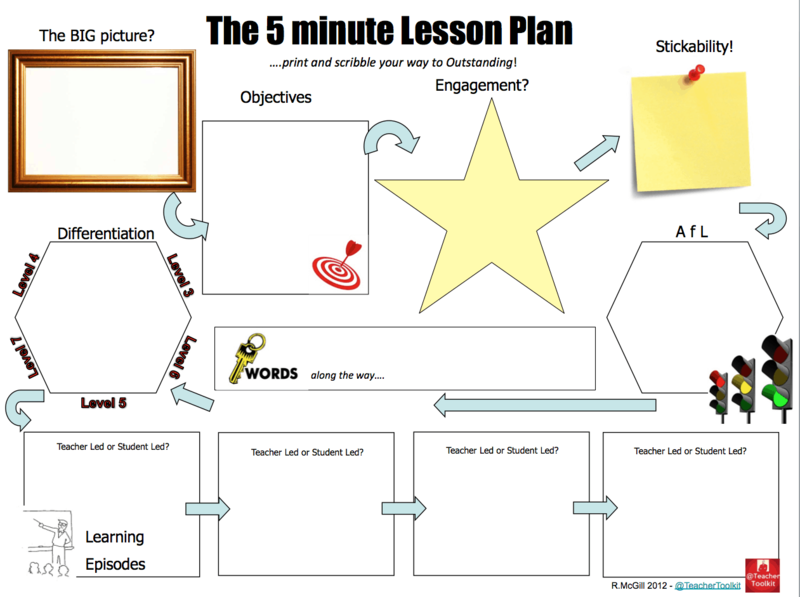 In order to achieve this, we move away from the traditional method of lesson plan to a more dynamic 5 Minute Lesson Plan by TeacherToolkit (http://www.teachertoolkit.me/the-5-minute-lesson-plan/). Even though a lesson plan is only a tiny part of the enormous range of components needed to become a ‘good’ teacher, to plan a good lesson plan like the one here, requires teachers to review their content and inject a lot of dynamism in the instruction. This is how the 50 minutes session is utilised to the max. Last but not least, I believe that the combination of strong knowledge and a heart full of love and compassion will inspire students. One of the most important evidence to the greatness of Muhammad PBUH, is his companions, his ‘students’. Artikel yang sangat memberi inspirasi. terima kasih ustaz. cuma kalau mengajar dipusat tuisyen, yang memang tujuannya untuk menyediakan pelajar cemerlang peperiksaan, agak susah untuk diaplikasikan.